Our magazine, Azerbaijan International, officially represents SOCAR (State Oil Company of Azerbaijan Republic) to the international community. Each issue we consult with SOCAR's President, Natig Aliyev, his Vice-Presidents and staff to report on some of the latest trends and developments. SOCAR, one of the largest oil companies in the world with 76,000 employees, has already signed numerous major consortium to develop the offshore fields. See "Contracts." 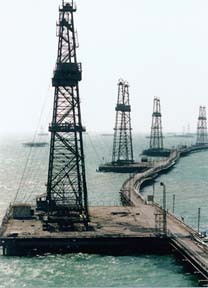 Azerbaijan International Operating Company (AIOC) is a consortium comprised of 11 international oil companies from seven countries which are in the process of developing the largest known offshore oil fields in the Azerbaijan Section of the Caspian Sea (Azeri, Chirag and the deepwater section of Gunashli). The work is being done with the State Oil Company of Azerbaijan Republic (SOCAR). Each issue has a regular feature of AIOC's activities highlighting new developments and trends. The oil companies include: British Petroleum (UK), Amoco (USA), Unocal (USA), LUKoil (Russia), Statoil (Norway), Exxon (USA), Turkish Petroleum (Turkey), Pennzoil (USA), ITOCHU (Japan), Ramco (UK), and Delta Nimir Khazar (Saudi Arabia).